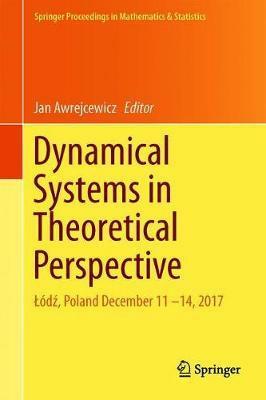 This book focuses on theoretical aspects of dynamical systems in the broadest sense. It highlights novel and relevant results on mathematical and numerical problems that can be found in the fields of applied mathematics, physics, mechanics, engineering and the life sciences. The book consists of contributed research chapters addressing a diverse range of problems. The issues discussed include (among others): numerical-analytical algorithms for nonlinear optimal control problems on a large time interval; gravity waves in a reservoir with an uneven bottom; value distribution and growth of solutions for certain Painleve equations; optimal control of hybrid systems with sliding modes; a mathematical model of the two types of atrioventricular nodal reentrant tachycardia; non-conservative instability of cantilevered nanotubes using the Cell Discretization Method; dynamic analysis of a compliant tensegrity structure for use in a gripper application; and Jeffcott rotor bifurcation behavior using various models of hydrodynamic bearings. Illustrations note 200 Tables, color; 78 Illustrations, color; 89 Illustrations, black and white; XI, 413 p. 167 illus., 78 illus. in color. The book consists of contributed research chapters addressing a diverse range of problems. The issues discussed include (among others): numerical-analytical algorithms for nonlinear optimal control problems on a large time interval; gravity waves in a reservoir with an uneven bottom; value distribution and growth of solutions for certain Painlevé equations; optimal control of hybrid systems with sliding modes; a mathematical model of the two types of atrioventricular nodal reentrant tachycardia; non-conservative instability of cantilevered nanotubes using the Cell Discretization Method; dynamic analysis of a compliant tensegrity structure for use in a gripper application; and Jeffcott rotor bifurcation behavior using various models of hydrodynamic bearings. Argaez, C., Giesl, P. and Hafstein, S. F: Computational Approach for Complete Lyapunov Functions.- Auciello, N. M., Rosa, M. A. D., Lippiello, M. and Tomasiello, S: Non-conservative Instability of Cantilevered Nanotube via Cell Discretization Method.- Beldowski, Piotr., Weber, P., Leon, T. D., Auge II, W. K. and Gadomski, A: Fractional Calculus Evaluation of Hyaluronic Acid Crosslinking in a Nanoscopic Part of Articular Cartilage Model System.- Bis, A. and Namiecinska, A: Topological and Measure-theoretical Entropies of a Solenoid.- Bjornsson, H. and Hafstein, S. F: Lyapunov Functions for Almost Sure Exponential Stability.- Borkowski, L: Numerical Analysis of Dynamic Stability of an Isotropic Plate by Applying Tools Used in Dynamics.- Byrtus, M. and Dyk, S: Jeffcott Rotor Bifurcation Behaviour Using Different Models of Hydrodynamic Bearings.- Carvalho, A. and Pinto, C. M. A: The Burden of the Coinfection of HIV and TB in the Presence of Multi-drug Resistant Strains.- Ciechanowicz, E. and Filipuk, G: Value Distribution and Growth of Solutions of Certain Painleve Equations.- Danik, Y., Dmitriev, M., Makarov, D. and Zarodnyuk, T: Numerical-analytical Algorithms for Nonlinear Optimal Control Problems on a Large Time Interval.- Demiyanushko, I., Vakhromeev, A., Loginov, E. and Mironova, V: The Dynamic Behavior of the Vehicle Wheels under Impact Loads - FEM and Experimental Researches.- Luz Junior, J. A. G., Tusset, A. M., Janzen, F. C., Rocha, R. T., Balthazar, J. M. and Nabarrete, A: Optimal Control for Robot Manipulators with Three-Degress-of-Freedom.- Jackiewicz, J: Optimal Control of Automotive Multivariable Dynamical Systems.- Jackowska-Zduniak, B. and Forys, U: Mathematical Model of Two Types of Atrioventricular Nodal Reentrant Tachycardia: Slow/fast and Slow/slow.- Klimina, L., Shalimova, E., Dosaev, M., Lokshin, B. and Samsonov, V: Two-frequency Averaging in the Problem of Motion of a Counter-rotating Vertical Axis Wind Turbine.- Knap, L., Maczak, J. and Trojgo, M: Process-oriented Approach to the Design of Cyber-physical Systems.- Koruba, Z., Gapinski, D. and Szmidt, P: An Inverse Dynamics Analysis of the Remote Controlled Artillery-missile system Under the Influence of Disturbances.- Kozanek, J., Chladek, S., Zapomel, J. and Svamberova, L: Approximate Identification of Dynamical Systems.- Makowski, M: Algorithm for Damping Control in Vehicle Suspension Equipped with Magneto-rheological Dampers.- Oprocha, P: Shadowing, Entropy and Minimal Sets.- Ozga, A: Analysis of Vibrations of an Oscillator Using Statistical Series.- Pawlak, R. J. and Korczak-Kubiak, E: On Local Aspects of Entropy.- Pytlak, R., Suski, D. and Tarnawski, T: Optimal Control of Hybrid Systems with Sliding Modes.- Rysak, A., Gregorczyk, M., Chwelatiuk, K. and Gaska, D: Study of the High-amplitude Solutions in the System of Magnetic Sliding Oscillator with Many Degrees of Freedom.- Scharff, M., Darnieder, M., Steigenberger, J., Alencastre, J. H. and Behn, C: Theoretical Investigations on the Behavior of Artificial Sensors for Surface Texture Detection.- Sumi, S., Schorr, P., Bohm, V. and Zimmermann, K: Dynamic Analysis of a Compliant Tensegrity Structure for the Use in a Gripper Application.- Szmit, Z., Warminski, J. and Latalski, J: Synchronisation Analysis of a De-tuned Three-bladed Rotor.- Szulim, P. and Radkowski, S: The Analytical Approach for Identification of Magnetically Induced Vibrations of Working in Faulty State BLDC Motor.- Tomczyk, B. and Szczerba, P: Micro-Dynamics of Thin Tolerance-Periodic Cylindrical Shells.- Wojnar, R. and Bielski, W: Gravity Waves in a Reservoir with Uneven Bottom: Asymptotic Approach.- Wolinski, L: Implementation of the Adaptive Control Algorithm for the KUKA LWR 4+ Robot.- Zakes, F. and Sniady, P: Vibrations of a Multi-span Beam Subjected to a Moving Stochastic Load.